What is a Schmidt telescope? Invented by the German optician Bernhard Schmidt (1879–1935), this kind of telescope has a primary mirror as its main light-gathering component. This mirror is specially shaped so it can look at a very wide area of the sky at once. Like a “fish-eye” lens on a camera, however, the resulting image is distorted. Thus, a special, thin lens is placed in front of the mirror, which corrects the distortion. This Schmidt design, which uses both refraction and reflection of light, is ideal for obtaining wide-angle images of the sky. It is often used in astronomical cameras. 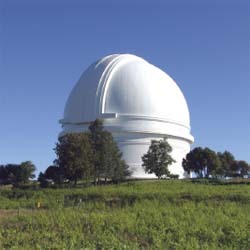 The largest Schmidt telescope, having a primary mirror 48 inches in diameter, is located at Palomar Observatory in San Diego County, California.